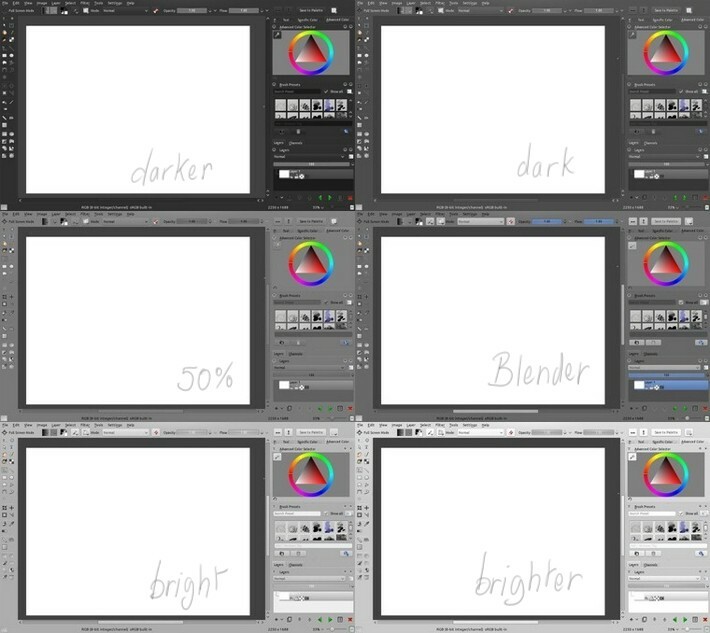 This resources became the default bright, dark and blender theme included in Krita 2.8 and newer versions . You probably don't need to install this. A small post to share the colors themes I did for the new feature of the next Krita 2.5 : changing the color theme on the fly. It's an advantage while painting to not get surrounded by a too bright user interface or get influenced by teinted warm or cold grey user interfaces. It's also confortable to have many choice and switch them according to your mood or type of work you need to do. ( ex: bright interface for line art or sketching , mid grey for precise color works , dark for late night working ...etc... ). Extract the archive, and put the *.colors files inside <your-user-name-home>/.kde/share/apps/color-schemes folder. Open Krita, and go in the top menu to Settings > Themes , and select one of the 6 theme with the prefix 'Krita'. mentioned at the end of the article, 16 july 2012 . Cant believe no one commented yet. Thank you - this makes Krita look very professional and modern. Sadly on Windows not all changes are supported (hope that it will change) but I am using one of them (50%) and it looks very cool. I may have to start using irc again after years - I am really loving Krita experience and I want to make it better on Windows platform by actively reporting bugs (which I am doing at the moment). This software have a lot of stuff that photoshop doesn't! I just setup sweet 2 point perspective grid using ruler tool (person who made possible merging ends of different rulers is a genius :D), setup custom shortcut for hiding painting assistance and voila - got something that in photoshop I have to use layers for and then look for them to turn off visibility... Still missing some brushes I have in photoshop - need to take a closer look at brush creation in Krita (can photoshop brushes be used? Or maybe it is planned for the future?). In any case thank you for constant upload of new stuff! I will just check your brush pack for Krita now - maybe it has what I am missing a bit... See you around! Greetings from Mexico. BUT I have a problem. My version of krita doesn't have the "Themes" under the "Settings" menu :P any idea what I'm doing wrong? @Bionyte : Hey , thats why I wrote in the article "for the new feature of the next Krita 2.5" , If you want to test it on the future Krita 2.5 , you must compile source for the moment. The release will come soon and hit the repo of 12.04 , I think. @nezumi : Thats really good if you report bug on the Windows version :) very good help to 'iron' this version. I also like using rulers as perspective guide ^ ^ I used it a lot on Mango 'Tears of Steel' concept art. Do you think the default theme will be one of the dark ones? Because, you know, it just looks more pro. @Yuri Fidélis : Hey, thanks for the feedback. I think the default one will stay the 'system' one by default. May be for Windows user a darker one will make sens. Thank you for your work and for sharing! Incredible, what you already have done for the Linux / MyPaint / Krita / GIMP community. Please also keep updating your artworks; your workflow and your style is very inspiring. Krita-Darker is Awesome! Combined with Oxygen-Transparent it makes the KDE desktop look really good. Do you have the css instead of .colors? @Salum :Thank you. Sorry, I don't have a CSS version. First of all, I shall thank you for all effort put into making bundles, tips, Krita related stuff and sharing it with community! Now then, how can I install these to the newest Krita 3.0 Appimage? I'd like to install the darker one, which unluckily hasn't been included into Krita's packages yet. Hehe , I understand it. I just tried to open the appimage, but I even couldn't decompress it here. Maybe paste the *.colors files into /home//.local/share/color-schemes ( create the folder if this one don't exist ). ... and it's still works as expected. As you can see on my comparison screenshot — this is not right. The value changed a little in new version of krita, and it is not the same as gray photoshop any more! I also tweaked a little right panel, if some one interested I can share it. For the "it's not true" ; maybe it's wise to say "it's not true *anymore*" , but it was true at the time I published them. My work was modified by the Krita UI team after that ; probably for good reasons. I'm happy of the mod you propose with this fade grey GUI. Can you post it on the Krita forum ? I'm sure the team will be interested to include it in future version. Thank you! Hi David, I'm feeling a bit crazy and wanted to edit a theme for myself and so i opened up the folder and picked out the Krita Dark.colors to edit. Which lines/ numbers should i change? and how do i see the effect? should i close and reopen Krita to see the effects? I opened the file in Notepad ++ , i just dont know which lines to change to make just the background of everything a different shade. On KDE desktop on Linux, there is a graphical editor for it in the settings. It already feels complex; their is so many colors and key. I can't guide you to edit them with only a text editor. I'm not familiar with the terms used, and I edit the text file only when I need to batch replace a color socket appearing multiple time with one another. Thanks for that. I wish they had different icon themes to select though. I think is kind of a waste to not use colors on the icon set for a stronger recall and faster/reflexive identification. I guess they've favored a more photoshopish look. I'd like to at least copy the general color scheme of GIMP's icon colors, but unfortunately on Krita they're hard-coded, so it would require to rebuild the whole thing, and compiling KDE stuff is just frightening.